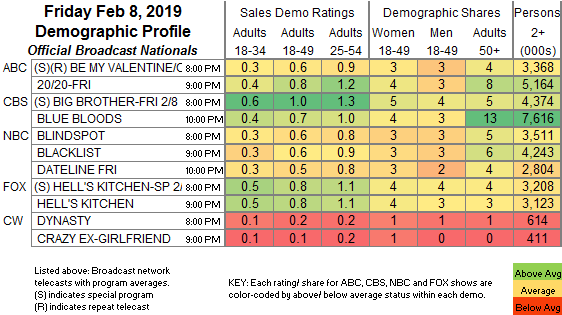 NETWORK FINALS: BLINDSPOT gained 0.1 in final numbers. CABLE HIGHLIGHTS: A&E’s LIVE PD led Friday cable, down a tick to 0.64. On Discovery, a GOLD RUSH special dropped 0.11 from last week’s regular episode to 0.53, and the lead-out hour was down 0.04 to 0.40. ESPN’s NBA doubleheader was at 0.52/0.51. HGTV’s MY LOTTERY DREAM HOUSE ticked down to 0.31. Adult Swim’s TROPICAL COP TALES was at 0.28/0.25, compared to last week’s 0.28/0.21. VH1’s RUPAUL’S DRAG RACE gained 0.02 to 0.27. 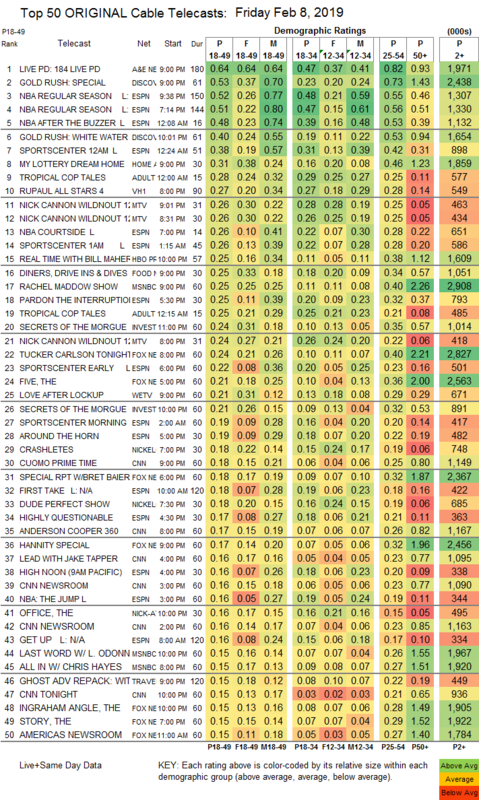 MTV’s WILD N OUT was at 0.26/0.26/0.24, compared to last week’s 0.26/0.25/0.24. HBO’s REAL TIME WITH BILL MAHER lost 0.06 to 0.25, and 2 DOPE QUEENS returned at 0.05. MSNBC’s RACHEL MADDOW SHOW led cable news at 0.25/0.40/2.9M, with Fox News’s TUCKER CARLSON TONIGHT at 0.24/0.40/2.8M, and CNN’s CUOMO PRIME TIME at 0.18/0.25/1.1M. On ID, SECRETS OF THE MORGUE was at 0.24/0.21 compared to last week’s 0.21 hour. On We, LOVE AFTER LOCKUP fell 0.14 to 0.21, and EXTREME LOVE was at 0.08.